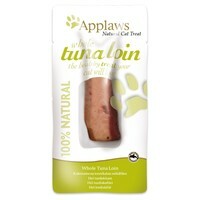 Applaws Whole Tuna Loin Cat Treat is a delicious and healthy treat for adult cats packed with lean protein goodness. Using only natural ingredients including the finest hand-cut tuna loins, the treat can be given either whole or broken into pieces, and contains no fillers, artificial flavours or preservatives. My Cat Loves these, A bit expensive, but, As a treat, Worth it.